Click Font to specify the font. Type the text into Text area. Specify the picture you want to be a watermark. You can change the size of the watermark by dragging the edges of its frame. Please note that changing the size of a watermark do not keep the initial proportions. 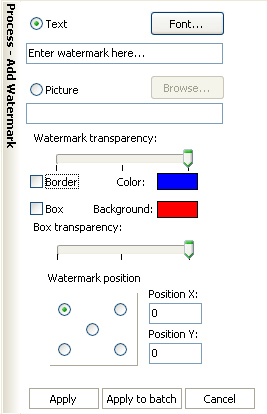 Watermark transparancy allows you to change your Watermark transparancy. Border allows you to set a border of your watermark and customize its color. Box allows you to fill the box with the text using customized color. Please note that this option is available only for text watermarks. You may change the position of your watermark. Use Watermark position area or simple move with the mouse. Click Apply you want to apply changes to one file. If you don't like effect, use CTRL+Z combination or Edit -> Undo from the menu bar to move back to the original image.